PVDF coating (polyvinylidene fluoride) is a pure thermoplastic fluoropolymer that is non-reactive and possesses multiple coating benefits. PVDF coatings for steel, aluminum, and other metals also have a high dielectric strength, excellent resistance to weathering elements in harsh environments. 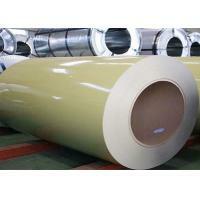 generally, includes PE coated aluminum coil and PVDF coated aluminum coil. Coated aluminum coil is widely used to manufacture aluminum composite panel, aluminum ceiling, roofing, aluminum veneer, signboards. Supply a physical sample of custom color. A color sample on metal is preferred. If other, it is also acceptable. But the color matching rate may be not good as color on metal. New color sample is usually offered by our paint supplier in 5-7 days, special color should be in 7-10 days. Color difference maybe occurred in different production batch, so it is suggested all panels are placed in one order for same project. And keep same direction as arrow on protective film when installing to avoid any color difference by vision. As per types of surface coating of paint, color coated aluminum coils can be divided into polyester (PE) coated aluminum coil, fluorocarbon (PVDF) coating aluminum coil and Epoxy coated aluminum coil. Xiaoxian RuiYi is a professional supplier cooperated with factory supplying quality aluminum materials like aluminium sheet, aluminum coils, coated aluminum coils, treadplates, diamond aluminum plate sheet, 5 bars aluminum sheet, stucco aluminum coils. Awaiting for your new request with details.